At the weekend we took our annual run-cation to Canberra, a city which in my humble opinion, is massively underrated. I love it hard. We went to run but while we were there we ate, drank and had a culture injection – it always surprises me how much one can fit into 48 hours! Here’s what we saw, ate and did! 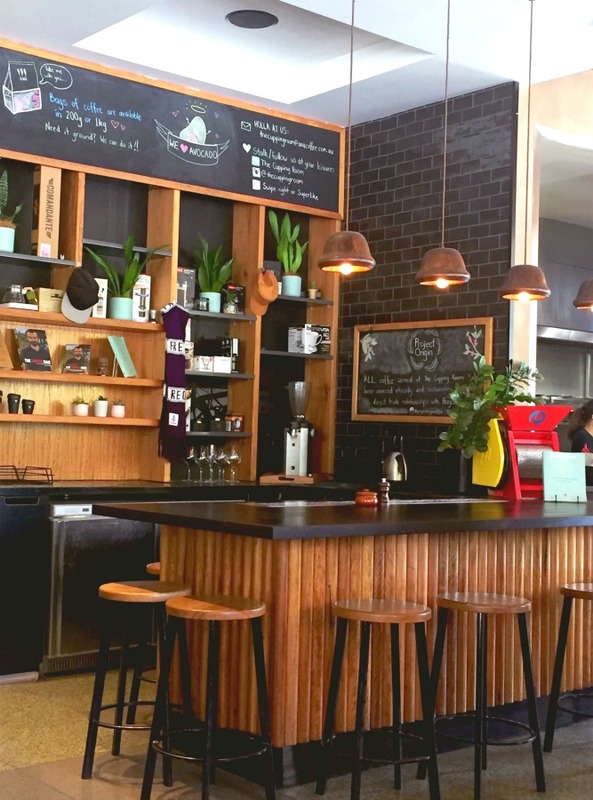 Bernie’s has been on our To-Eat list for (what seems like) forever and we’re so pleased to have finally made it, with a food fuel stop en route from Sydney to Canberra. 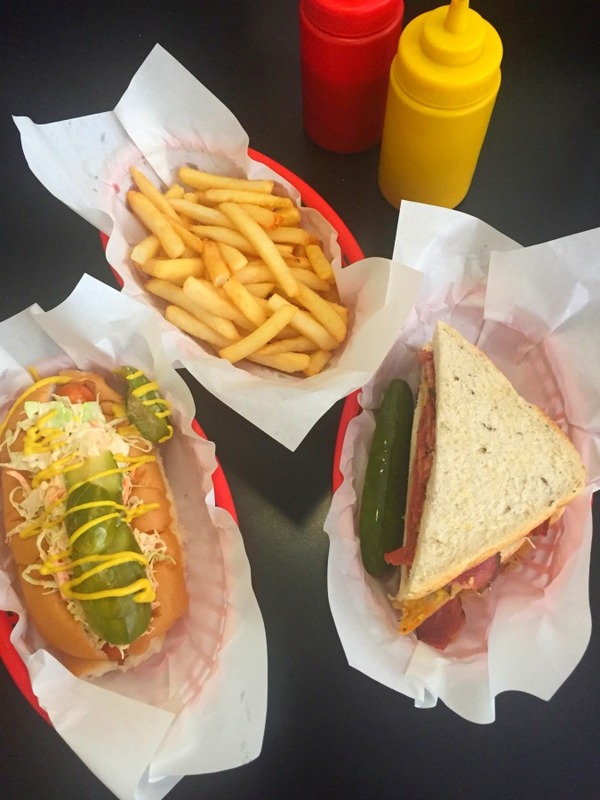 Bernie’s is one of the few examples of a quintessential American diner in Australia. The attention to detail to replicate a typical American diner is not just in the fit out, it’s in the menu too, something which pleases us greatly. We also order some fries and onion rings (the latter are also house made.) Alas, someone has beaten us to it and purchased all the day’s onion rings which is selfish on their part and heartbreaking on mine. Ioannis (the owner) is most apologetic, not only does he refund the cost of the onion rings, he gives us another generous side of fries too. I’m not surprised to learn via the interwebs that Ioannis (pronounced Yani) has worked around the world in food and hospitality because the service at Bernie’s is first rate. After the tragic lack of onion rings, Ionannis takes the time to come over and check how our food-fest is going. I tell him how my FOMO is raging, because not only do we miss out on the onion rings, but we’re an hour too late for the freshly made doughnuts. (They stop serving at 11am.) Ioannis insists on making me a doughnut even though things are hotting up and getting super busy. 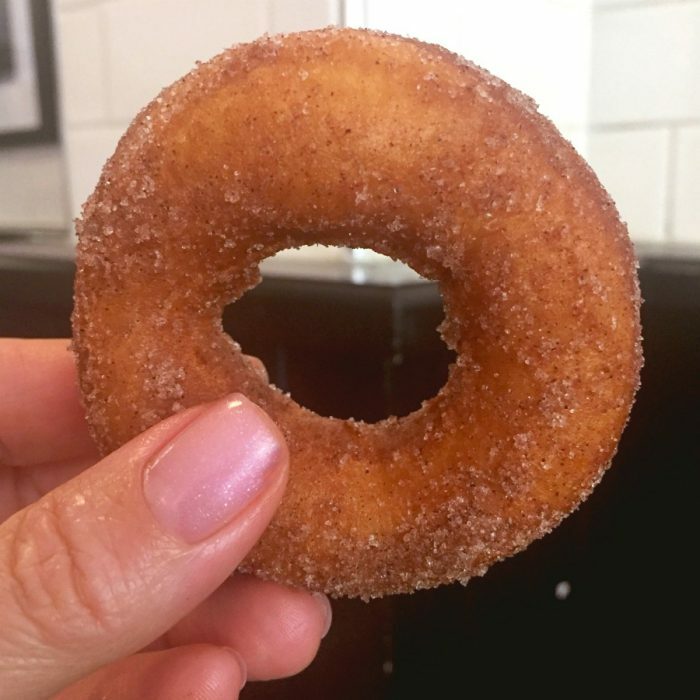 Needless to say the doughnut does not disappoint and we leave the full restaurant with full hearts, full bellies and a promise to return… Soon. It may be Friday the 13th but it’s an auspiciously delicious start to our trip. 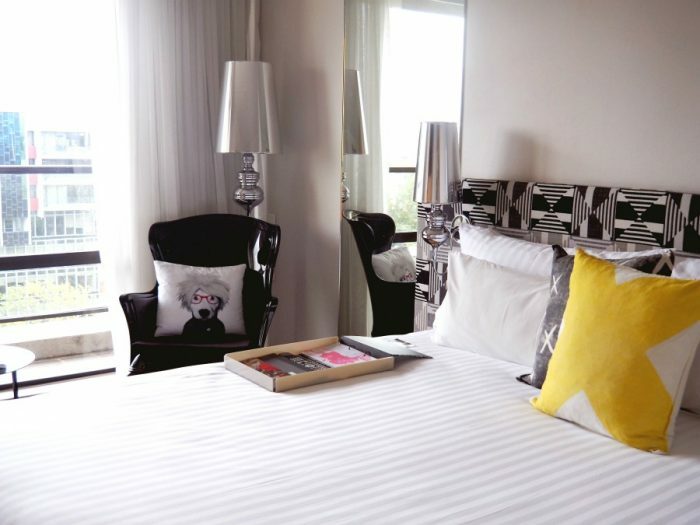 The QT is our number one place to stay in Canberra. It’s cool, it’s quirky and it’s comfortable and it’s location is hard to beat. 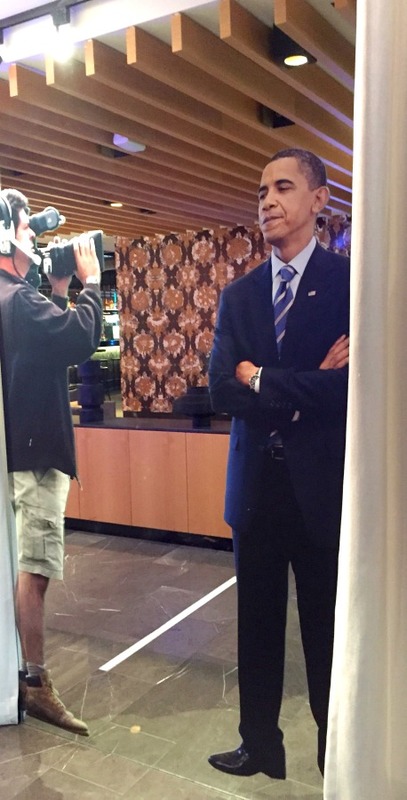 Besides, I don’t know many other hotels where you can meet Barack Obama in the lobby! Upon check in, we’re told that all the beds in the hotel have been upgraded to king beds, a situation I find most pleasing because my favourite sleeping position is “starfish.” Our QT King room has the quintessential dog cushion, the promised king size bed, a left of centre mini bar and lakeside views. I always get a bit twitchy after a long car journey so we take a stroll to the Canberra Centre, pick up some supplies and then stop for some liquid refreshment at Gus’ on the way home. 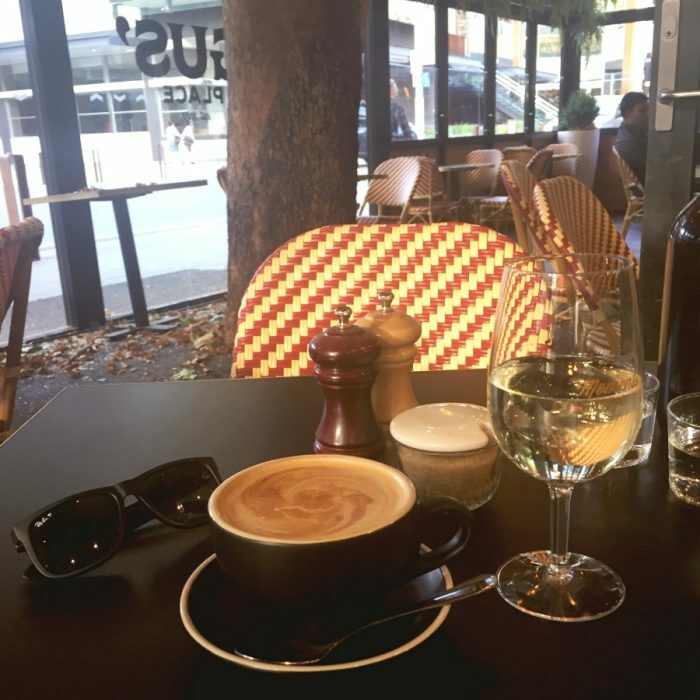 We have fond breakfast memories here from a previous Canberra encounter. It’s since been taken over so I can’t vouch for the food but the wine tastes just fine! 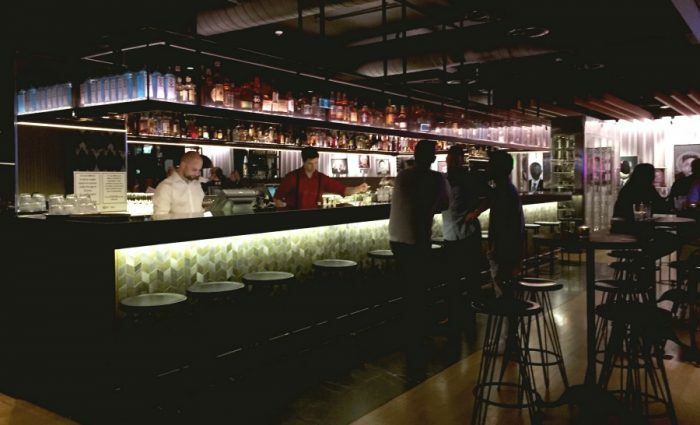 We get a great package with our booking which includes free parking plus drinks and share plates at Lucky’s Speakeasy. I am especially excited about Lucky’s because despite staying at the hotel four times in as many years, this will be our first visit to Lucky’s. Or not. It appears that there has been a mix up with our booking and a private event is being held in Lucky’s tonight for a room full of men wearing basketball shirts (over their Friday night attire.) We are neither wearing basketball shirts or on the guest list so along with the manager, we come up with an agreeable plan B. We still get our drinks and dinner but enjoy them in the Capitol Bar instead. 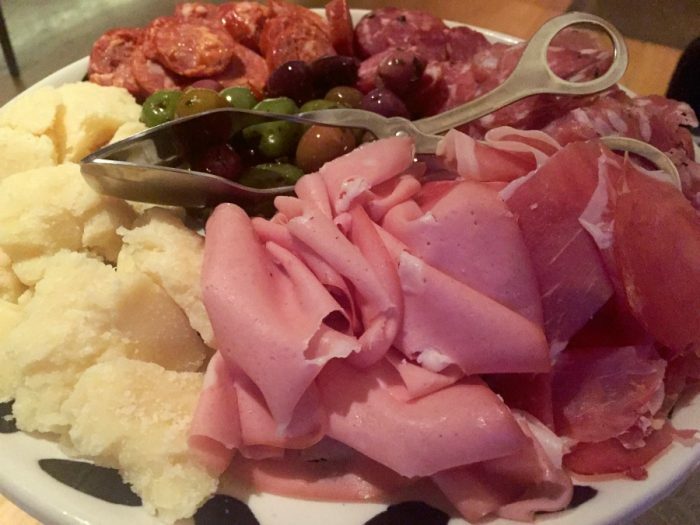 This involves a fair amount of Aperol Spritz, enough antipasto to feed a small army and some next level polenta chips. One thing is for sure we don’t go to bed hungry but we do go to bed early because tomorrow is the main event, the Australian Running Festival 10K. 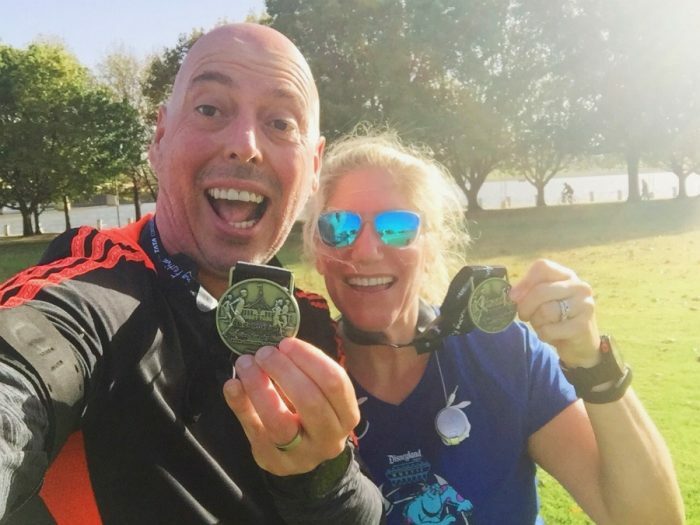 It’s not our first rodeo or our first Running Festival 10K, we’ve been enjoying the fun of the run since 2015. 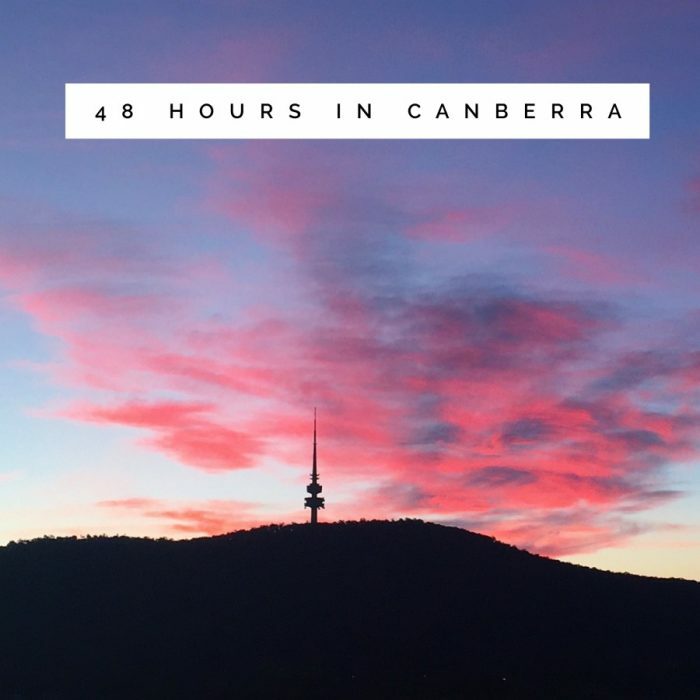 Despite the baltic conditions, nothing is going to dampen our spirits, the course takes us round some of the most spectacular buildings in the parliamentary circuit and around Lake Burley Griffin – it’s sightseeing on the run! Every year I get a little more slow but have no less fun, and this year is no exception, although there is the added excitement of my major bra malfunction just past the start line which brings a temporary halt to the proceedings. The moral of this story is nothing good ever comes of a sports bra held up by velcro. Just saying! It’s not often we go to the same place twice, especially when we’re weekending, but The Cupping Room is so good, we can’t wait to go back. Besides, the menu changes seasonally, so we figure it’s going to be a whole new experience. This joint is hip, airy and always super popular but luckily we don’t have to wait long. 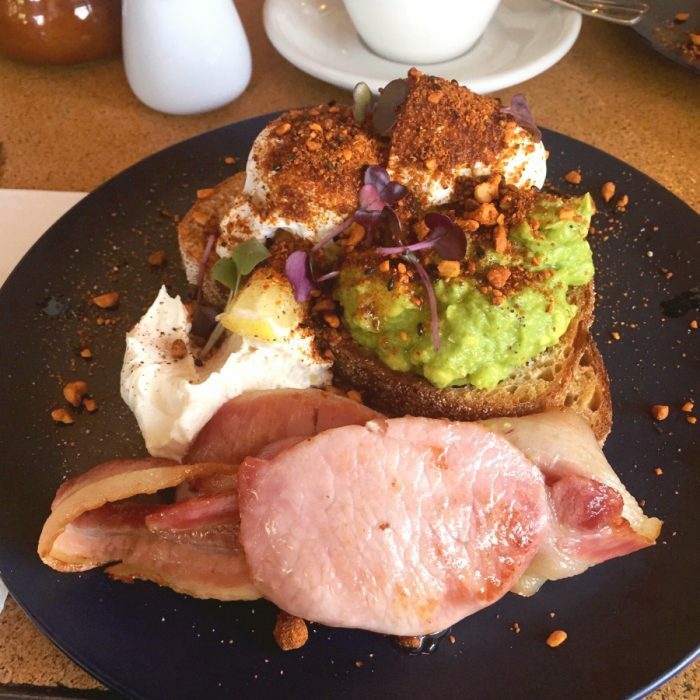 Neither of us are in the mood for food envy so we both chow down on the smashed avo, poached eggs, labne, dukkah on sourdough, with a side of bacon. 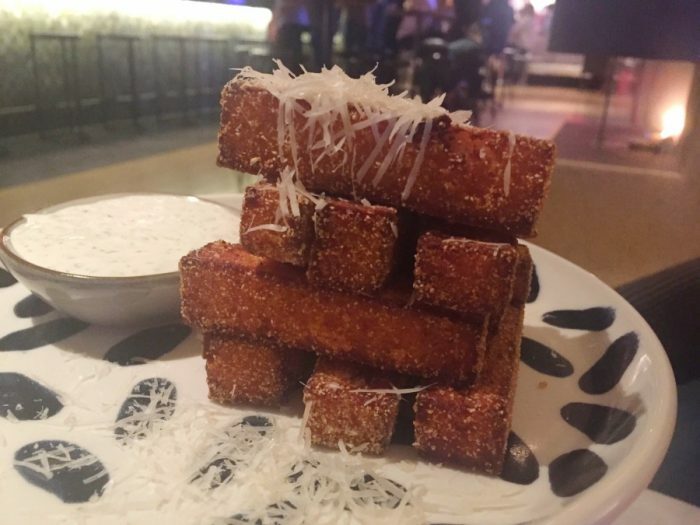 Because everything is better with bacon, amirite or amirite?! 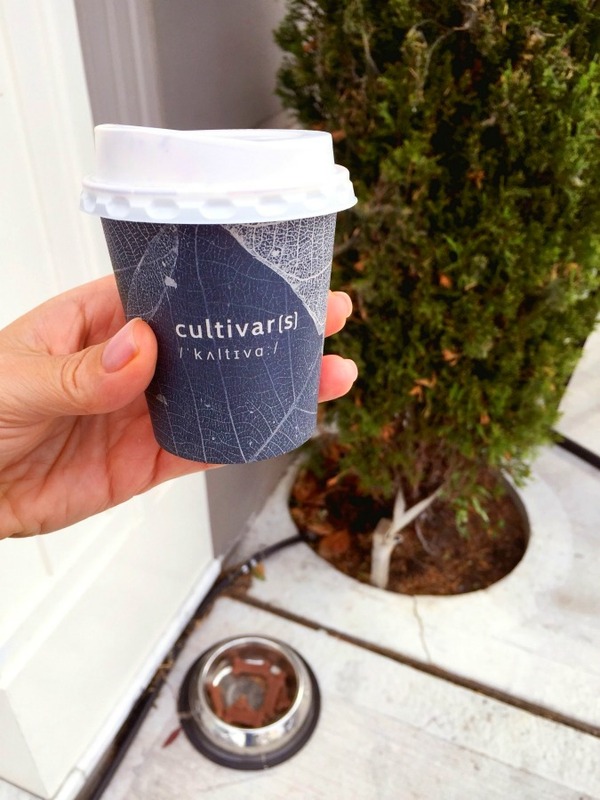 We love the boutique coffee, delicious, fresh seasonal food and great service as much as we did before, only more. I’m not a culture vulture by nature, but I cannot resist checking out the shiny world of Maison Cartier at the exhibition on at the National Gallery of Australia. David doesn’t share my enthusiasm but as it turns out there’s plenty to keep us both entertained – with over 3000 spectacular, bedazzling items as well as historical photographs, jewellery making tools and equipment that really gives an insight into the history of Cartier, their jewellery making and their patrons. 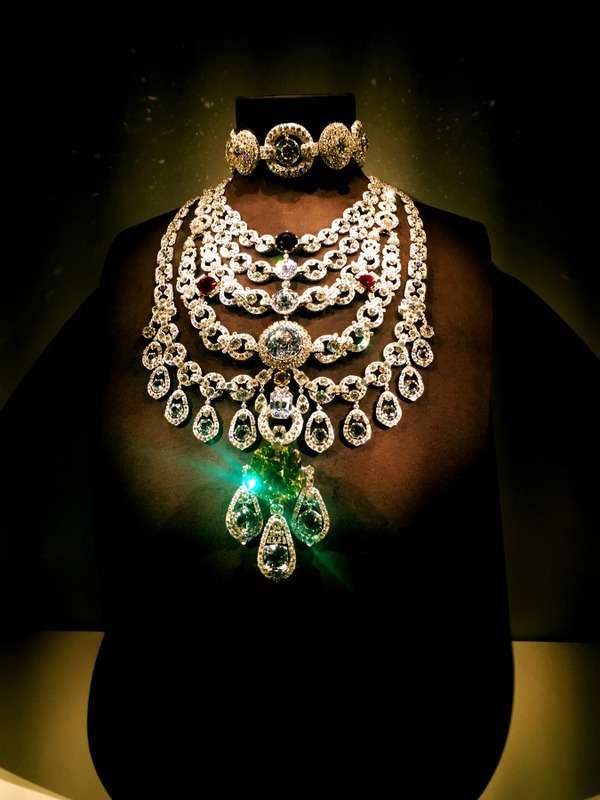 There are loans from royal families, celebrities and the Cartier collection itself and there are more tiaras, brooches, necklaces and earrings than you can shake a stick at. So. Much. Shiny. Lucky I’m a wannabe minimalist, so I’m able to look but not want, much to David’s relief. The exhibition is extremely popular and at weekends is super busy, so allow plenty of time and exercise plenty of patience, you’ll need it to wait your turn to get up close and personal with all the exhibits. The exhibtion runs to 22 July and tickets start from $20. Luckily, the rest of the gallery is free and so we take some time to explore the Aboriginal and Torres Strait Islander Art. The gallery is home to 7500 works and is the largest collection of Aboriginal art in the world. 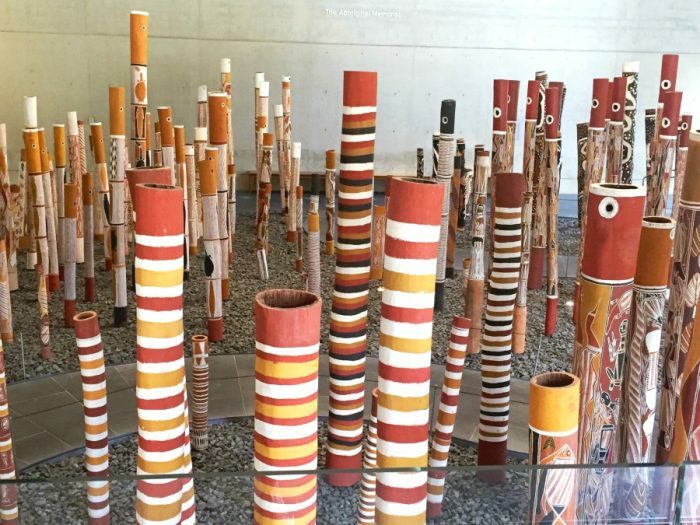 Particularly profound is the Aboriginal Memorial which is made up of more than 200 hollow log coffins from central Arnhem Land in the Northern Territory. 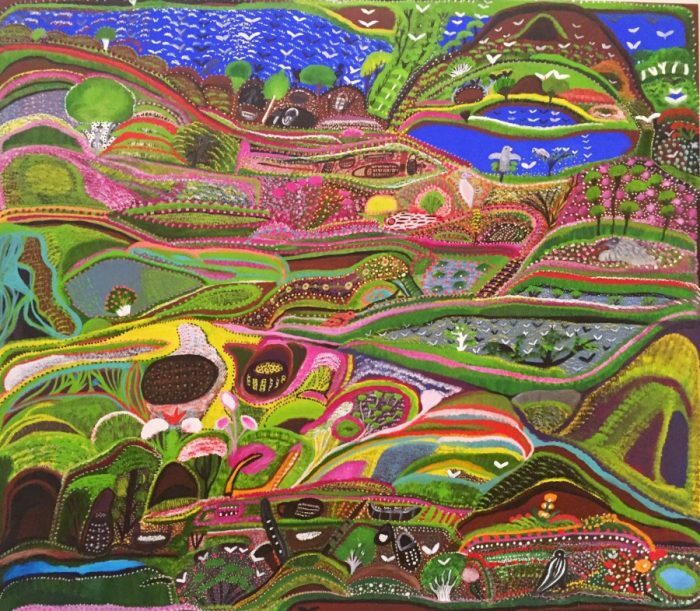 It is one of the most significant Indigenous works of art in the Gallery’s history. The poles are a memorial to all the Aboriginal and Torres Strait Islander people who since 1788, have lost their lives defending their land. My friend Rachel tells me about this place and I’m pleased she did. Thank you, Rachel! 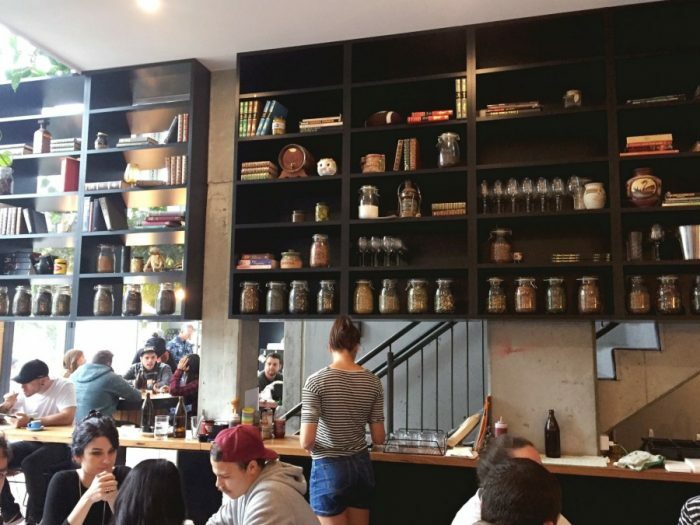 Nestled in the heart of a complex of office blocks, this cool, modern eatery is full, even on a Saturday afternoon. The menu makes my mouth water and the food that comes out of the kitchen looks epic but we’re too full from breakfast. I am most disappointed that I can’t find room for the unicorn pancakes! There are a range of next level drinks, including Strawberries and Cream and Malteaser shakes, 18+ shakes (with value added booze) and chilled drinks like Iced Nutella and Pretzel. 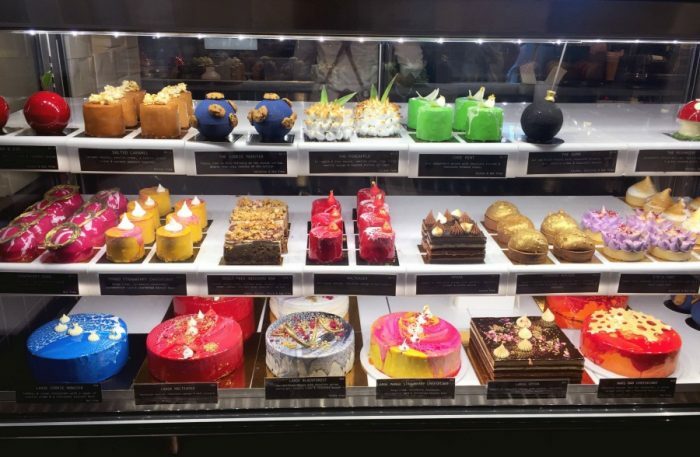 I want one of everything but I remind myself of the reason why I’m here and that reason is cake. I can always find room for cake. Rachel tells me that the cakes here are out of this world, and she’s not kidding. I’m not surprised to learn that Space Kitchen won Best ACT Patissierie in 2017, these are not so much cakes as works of art. The most difficult part is choosing which one to share because they all look amazing. 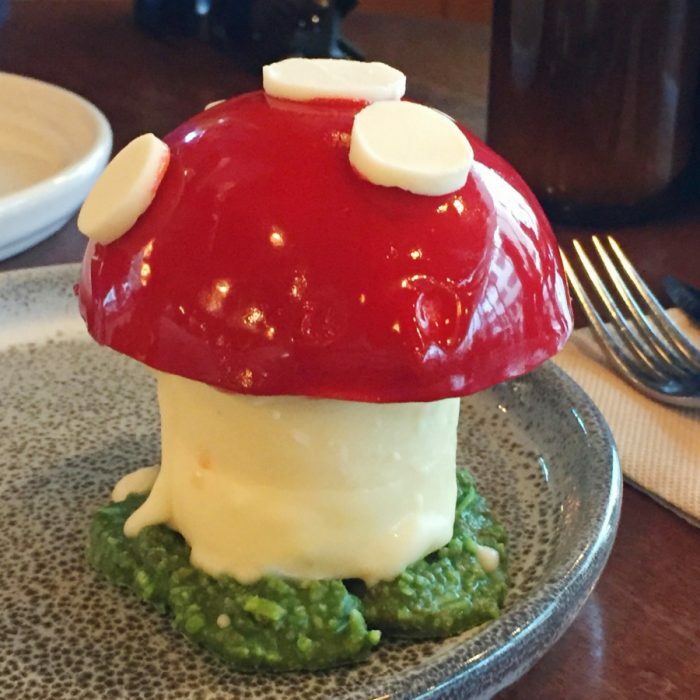 In the end, we settle on the mushroom because with it’s strawberry cheesecake top, vanilla pana cotta stalk, and coconut grass, our server assures us that it has a variety of flavours and none of them too rich or sickly. We demolish it! David and I are a diplomatic duo. I choose Space Kitchen, so he gets to choose where we go next. 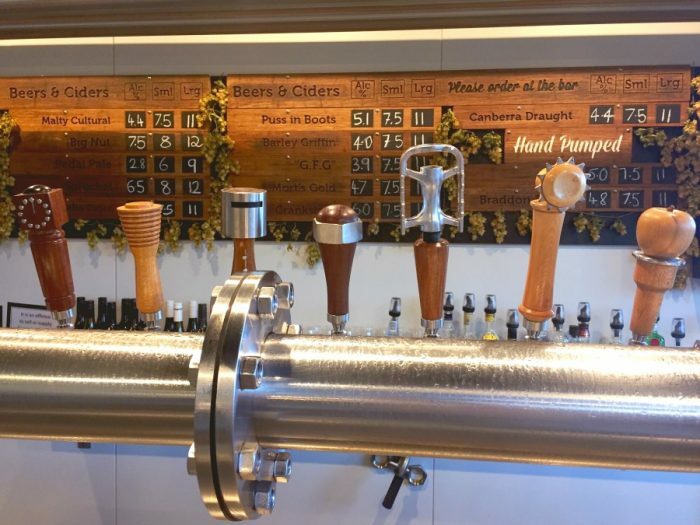 We park up at the hotel, stretch our legs and take a stroll to our favourite Canberra brewpub. I don’t think we’ve ever been to Canberra and not paid this place a visit. 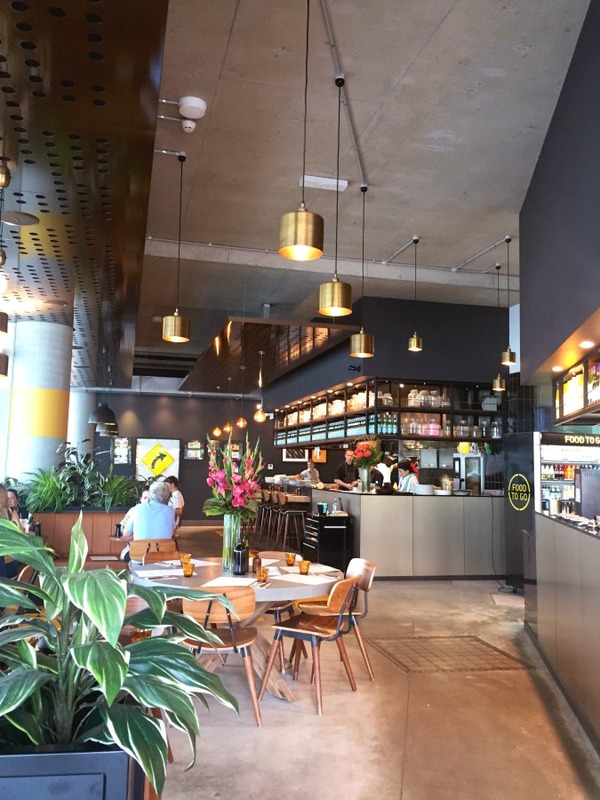 You don’t have to be a beer lover to enjoy this lively, modern, industrial pub – it has a great vibe and is the perfect place to kick back with a drink and the food is good too. There are a range of other drinks, but the beer is where it’s at, in fact, David’s favourite “Crankshaft” has been voted number three in the Aussie Craft Beers Hottest 100. With nearly 20 beers on tap, it can be hard to choose, but I can’t go past the GFG – a super zingy but deliciously sweet ginger beer. 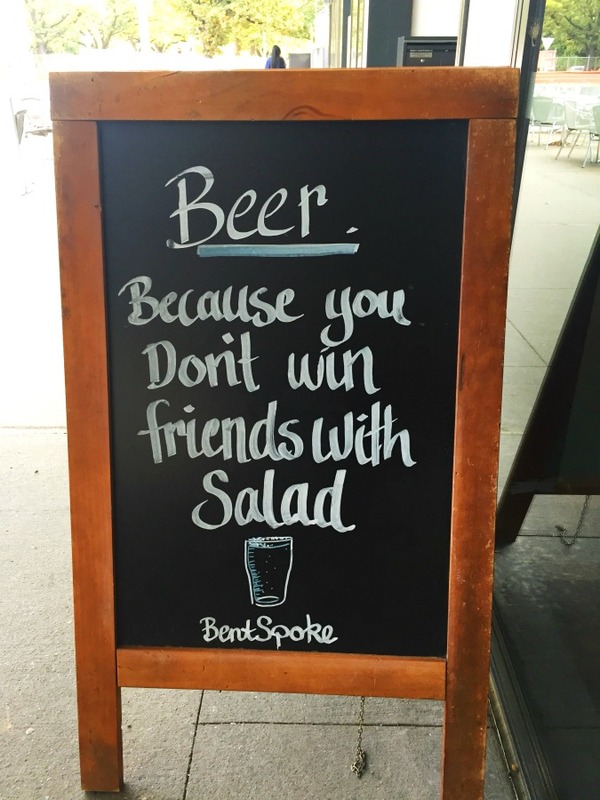 It’s really refreshing and totally hits the spot. 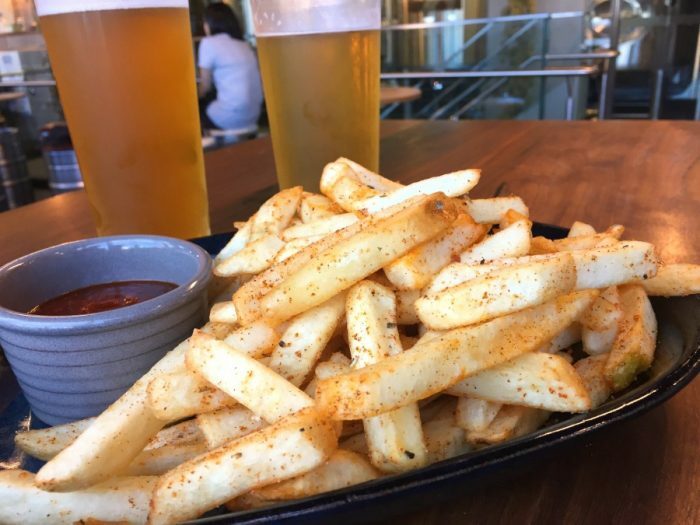 The hop potatoes (hop and malt dusted chips) with the side of brewery made barbecue sauce are mighty fine too! The weather is looking decidedly ominous and it’s blowing a gale so we decide to take shelter and taste some gin at The Tipsy Bull. Besides, I’ve heard great things about this place from my Instagram friend Nina and I’m keen as mustard to check it out. There’s a neat gin garden outside but we head indoors because there are way too many black clouds for my liking. If you’re thirsty, there’s beer, wine and cocktails but we’re here for the gin, and with well over 100 gins from around the world, we’re spoilt for choice. The staff here are friendly, knowledgeable and happy to share their gin expertise, because with so many good gins on offer, it can be hard to know where to start. I have to be honest, when my gin tasting paddle arrives, I’m not quite sure what to do with it, but the staff are more than happy to explain. First, you smell and taste the gin, rather like you would taste a sip of wine. Then you can decide whether to add ice, fruit or botanicals and tonic. 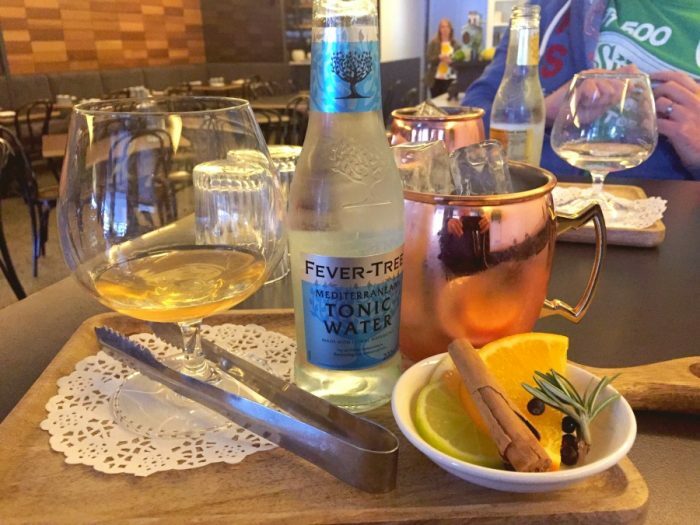 They serve Fever-Tree tonics here (currently the world’s number one tonic,) and each tonic is matched to the gin that it’s served alongside. My Mediterranean tonic is much sweeter than David’s more traditional Indian one. My gin is too good to be diluted with ice, but I do add some juniper berries, smash some rosemary and add a dash of that delicious tonic and I’m away! 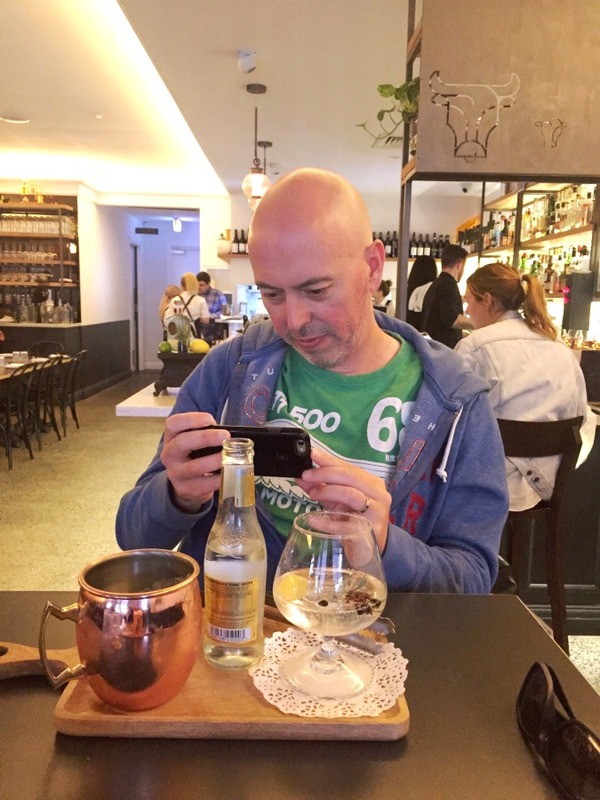 So is David, once he finishes instagramming his drink – I’ve trained him well! It’s a wonderful experience and we can’t to repeat it next time we’re in Canberra. 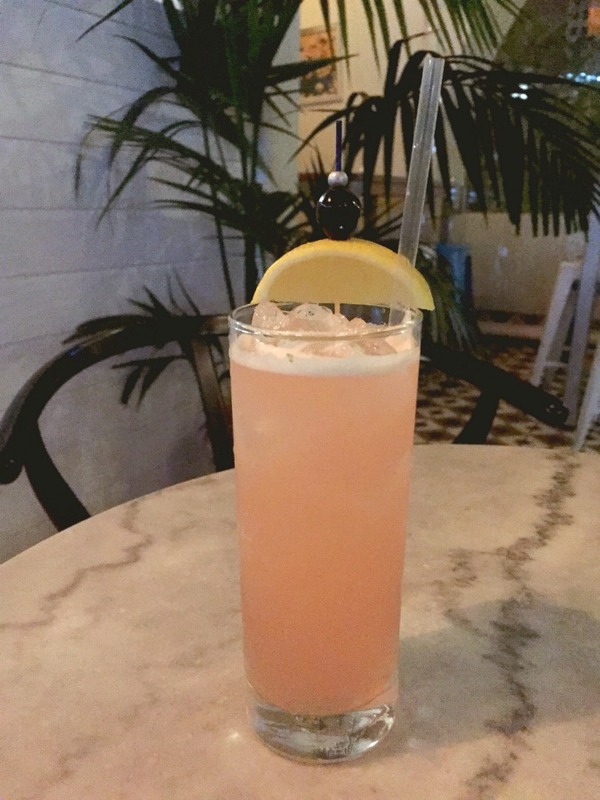 Named after an airline that would fly Americans down to Cuba for the weekend during prohibition, just so they could have a drink, this Cuban themed tropical bar is all about the secret squirrel. Although it’s located in the heart of the city in the Melbourne building, it’s accessed by a custom built spiral staircase off Odgers Lane. It’s a little bit tricky to find but worth seeking out. Despite it blowing a gale outside, it’s all tropical on the inside with white walls, palms and a long list of delicious cocktails. This bar is all about the rum with about 300 varieties to choose from plus 12 custom built barrels housing rum cocktails. I get into the spirit of the occasion with a highball cocktail, the Caribbean Cooler totally hits the spot! 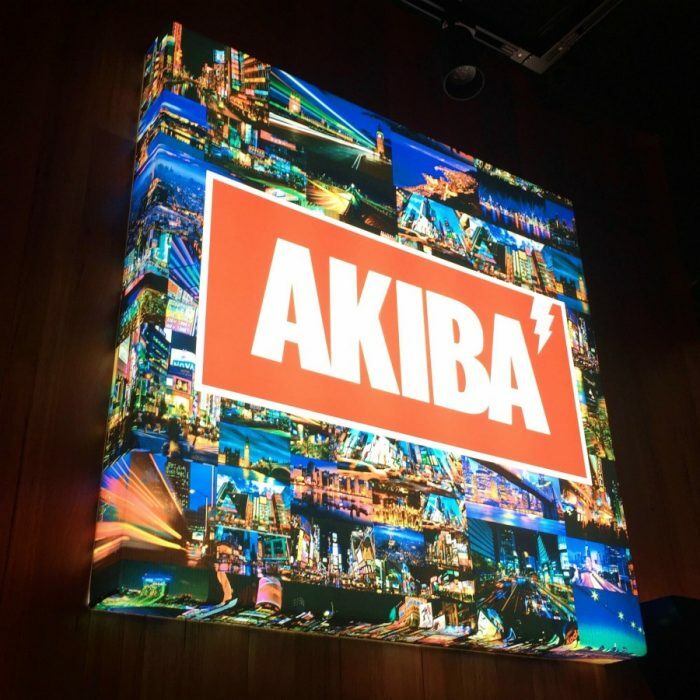 We’ve heard great things about Akiba so we’re very excited about dinner tonight. This place is heaving and has a great party vibe. I know I’m showing my age, but I can’t help thinking it’s a bit noisy. Nina says the beef short rib is one of her best eats of 2017, when we order it, we know why! We order four dishes plus rice and it almost all comes out at the same time which makes me so flustered I forget to take a photo of the complete ensemble. It also feels a bit rushed, even though I’m naturally a fast eater! 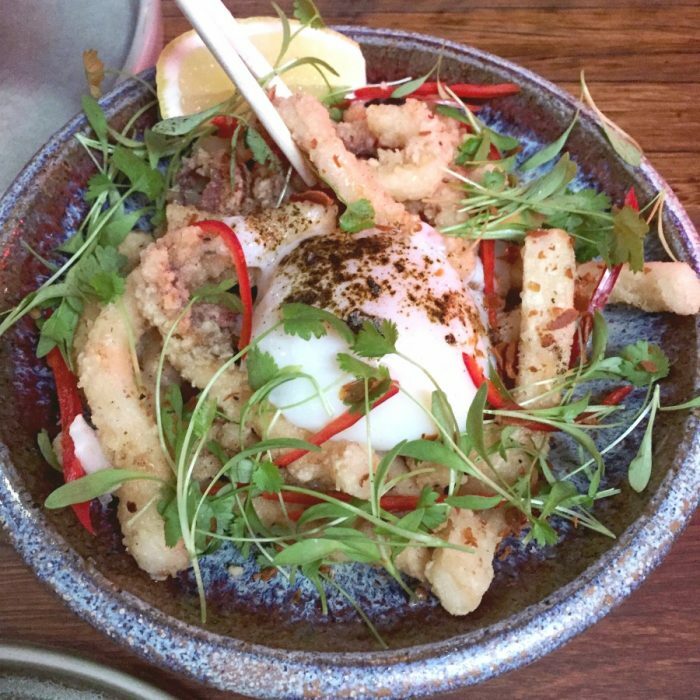 At least I get to snap the salt and sichuan pepper squid with onsen egg, it’s the business! Praise be to Nina for another top pick, excuse the pun! Brunch at Teddy Picker’s is a real treat. It’s a little bit out of town, but worth the ride. There’s a generous outside area which is perfect for patrons and their pooches and the inside is split over two levels so we don’t have to wait long for a table. 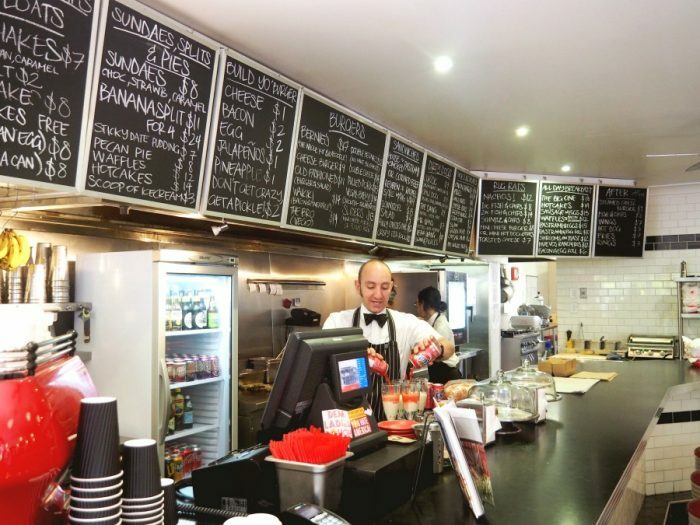 Staff are super friendly, there’s a relaxed vibe and everything looks delicious. That’s not all. The coffee is great too. I’ve got a hankering for pancakes but as there are none on the menu, I settle for the french toast which is about as close to pancakes as I can get. David makes the food choice of the day, his brekkie roll is a brekkie roll but not as you know it! 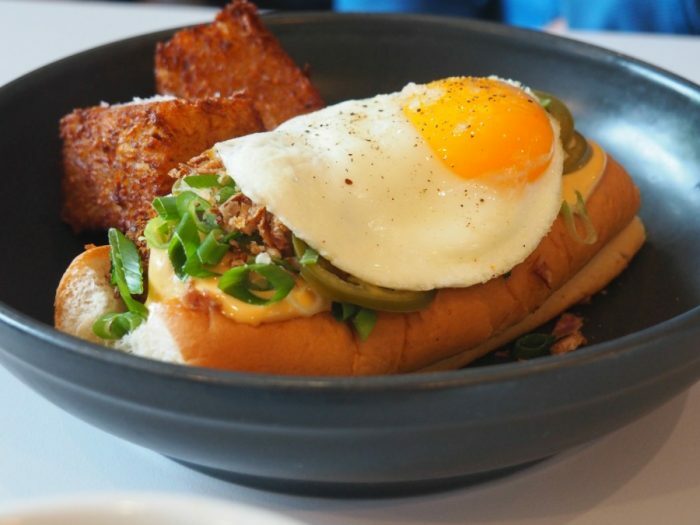 With it’s crumbed brisket, red eye aioli, pickled jalapenos, shallots and fried egg PLUS the side of hash browns, it really is next level. I can’t help but feel a little bit of food envy! A visit to Canberra is not a visit to Canberra without a visit to the Australian War Memorial. There’s a shrine, a world class museum and an extensive archive and there’s heaps to see and learn for all ages. Today I’m keen to check out the From the Shadows Exhibition which gives a fascinating insight into Australia’s Special Forces. 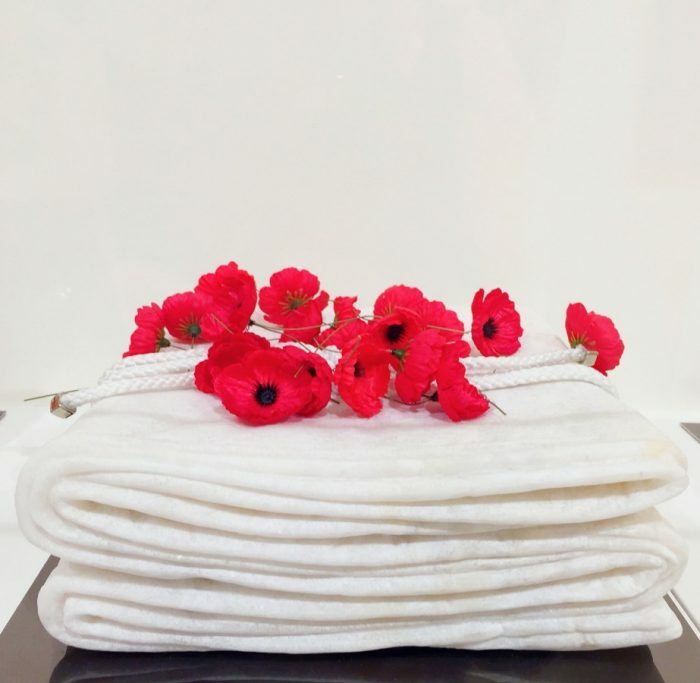 I’m also drawn to Alex Sexton’s As of today series which forms a sculpture monument to commemorate the Australian soldiers who have lost their lives as a result of their service in Afghanistan. It’s a beautiful, powerful but heartbreaking tribute, with the name of an individual soldier carved into the underside of each marble flag. 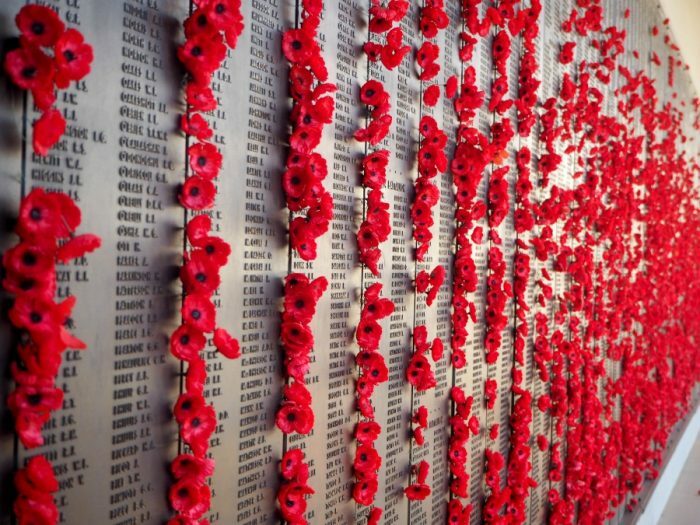 I can’t leave without seeing the Roll of Honour which contains the names of over 10,200 members of the Australian forces who have died during or as a result of armed forces. Their sacrifice allows us to enjoy the freedom that we do today. Lest we forget. We can’t fit any more food in but we can always make time for coffee so we enjoy a pit stop here on the way home. 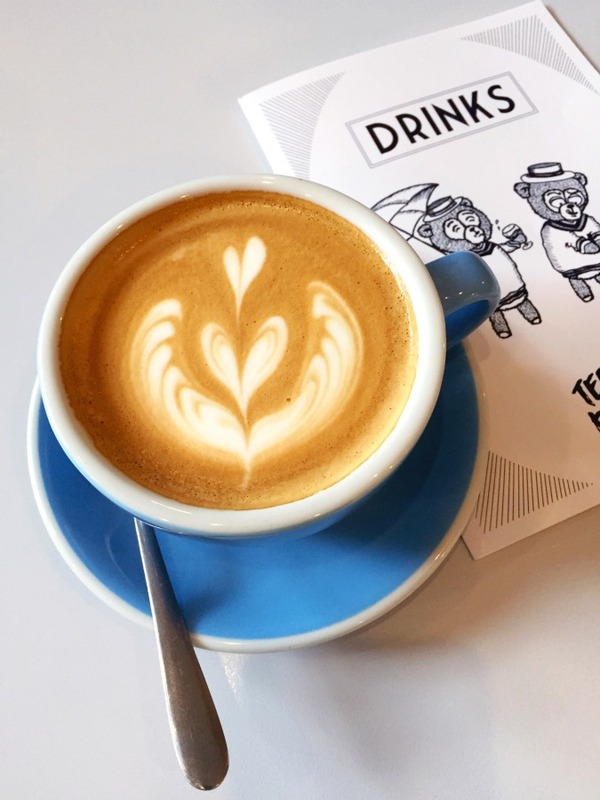 I don’t get nearly as much time as I’d like to swoon over the stationery and check out the old fashioned printing presses to the back of the cafe but I do leave with a smile and a cup of joe. Even the pups are made to feel welcome here! So Canberra, that’s a wrap… At least until next year! When was the last time you visited your capital city? Have you got anything I should add to the list? Hit me up! If you could take a road trip this weekend, where would you go? All accommodation, race entries, food and drinks were thoroughly enjoyed and independently paid for. As usual, all opinions are of course, honest and my own. Linking up with Kylie for IBOT.